BEAUTY AND the Beast is an allegory about the union between a man and a woman. On the one hand, we have the beast, a symbol of maleness at its most extreme: hairy, aggressive and emotionally illiterate. On the other, we have Beauty, the epitome of those traditionally feminine qualities of compassion, empathy and love. Thrown together in a castle in the Freudian darkness of a mysterious wood, they slowly learn from each other and, in so doing, experience a romantic awakening. The story’s archetypal power is undiminished in Catherine Wheels’ superb version, re-titled Caged in Rob Evans’ script, even though there is a shift in the portrayal of Beauty. Despite actor Rosalind Sydney having many of the plus-points any tyrannical beast would look for in a house guest – she always puts on a brave smile, keeps the place well aired and tidy, and does her best to make conversation – she is far from being a push-over. Indeed, there is something shocking about the way she rejects the overtures made by Andy Manley as Mr Hunter, aka the beast, as he makes a clumsy pass at her. Refusing to play the helpless girl-child, she tells him outright there’s no way she would marry him. Her hard-line stance makes you feel sorry for Mr Hunter, despite his violent temper and lack of etiquette. With his feline movements and animalistic clicks and grunts, Manley is every bit the beast, not just a deformed man but a wild, uncivilised creature without any experience of human interaction. On one level, he is terrifying ­­– which is why the show is pitched at 8 and over – but on another level, he is just trying to make the most of an emotionally deprived upbringing. He is socially inept but he has soul. We know which way the story is going, of course, but this is a clash of equals and a happy ending will only be on mutual terms. For much of the hour-long show, you’re convinced they’ll never work it out. The performances are great and so too is Gill Robertson’s production. 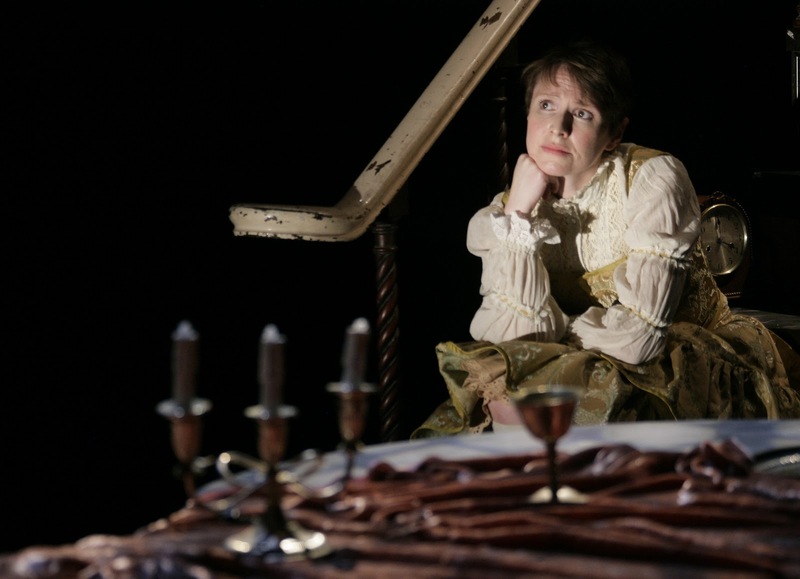 She uses Evans’ script as a jumping-off point for a rich, atmospheric and polished piece of theatre that communicates its gothic power as much through the music of David Paul Jones and the lighting of Lizzie Powell as it does through the dialogue. Whole scenes, in fact, are wordless, as the two actors run around the marble hour-glass table at the centre of Karen Tennent’s set, suggesting corridors, staircases and starlit vistas with the most economical of means.